Yeah, I see two in that picture. Gandhiji...and who could that being of pure light next to Desmond Tutu be if not Mor Ephrem? It could be Judas. I think I see a money bag in his hands. That's just cause Mor gets money, money Mor's got...he runs New York. Actually, I think the "Judas" figure might be Haile Selassie over on the right. 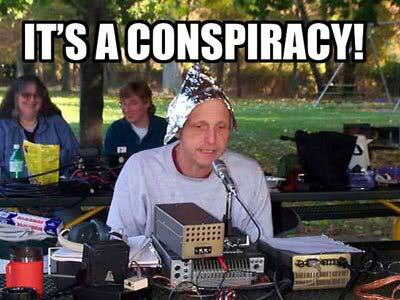 could that "whited out" figure be the...hmmmm...harrrrrr...."prophet"? That was my next thought too, Mina. But LBK was right. It's the Judas figure. The 13th figure, Judas, remains anonymous in the contemporary painting and is signified by a white shape - supposedly allowing viewers to draw their own conclusions about who it could be. isnt it always the white guy with the money? Interesting. No matter what, Judas is "Whitey". I don't think his skin tone is significantly lighter than some of the other figures in the piece. And most of the time, in black nationalist parlance, the term Judas is reserved for a black betrayer of the cause, like the guys who sold Marcus Garvey out to the feds or the guys who shot Malcolm X. Of course, from those guys' perspective, Malcolm X was the traitor since he had abandoned the NOI for traditional Sunni Islam, thus abandoning black nationalism in the process. Unless (as some old timers allege) they worked for the Feds. 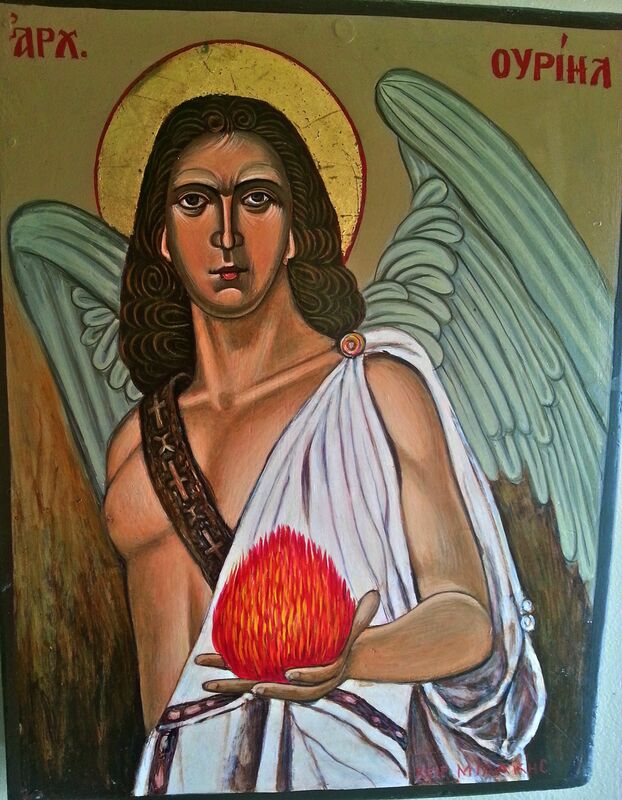 St. Raphael the Angel Martyr holding a child? The child in the one of Raphael is very likely Tobit. Not quite schlock (unusually, for something out of the Prosopon School), though there are better ways of portraying the archangel with Tobit. The Uriel painting? Now that's schlock. Ugh. I don't know, but he's definitely holding the fire that's going to emit from it when he starts to shred. 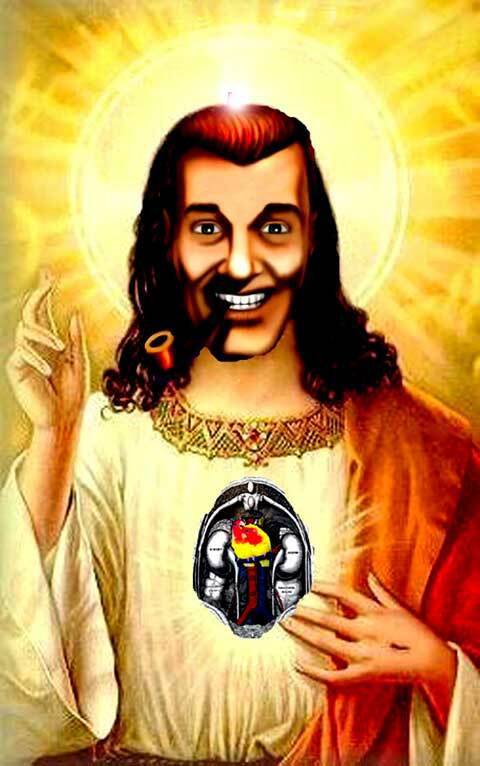 And this one is from the official website of the Church of the SubGenius, depicting J. R. "Bob" Dobbs as Jesus. An interesting thing about the Church of the SubGenius is that the group holds that the quality of "Slack" is of utmost importance—it is never clearly defined, but attaining it involves the avoidance of hard work and the embrace of leisure. What would Max Weber think? I want an icon of Maria Romanov seductively inviting me to become her tsar in exile. Aww, how sweet. I can just imagine what you two would do out there by yourselves. Personally, I couldn't think of anything more blasphemous than imagining such fantasies against a saint of the Church. I wouldn't encourage James in fantasizing about a murdered teenage saint. I'm sorry. I should really think before I randomly pop put with comments like that. Ahem, *Passion-bearer* you guys, not Saint. Regardless, I apologize for my public blasphemy. A Passion-Bearer is a type of Saint, just like Martyr, Confessor, Apostle, Equal-to-the-Apostles, Faster, etc. Also: She is a Martyr. Oh! I guess that changes everything. James can fantastize all he wants about having a sexual relationship with someone who's been dead for almost one hundred years because she wasn't really a martyr. Thanks, Volnutt! yes indeed...no further commentaries are necessary. This is enough, and I hope we just move on with the schlock. Thank you James and God bless you. The comment had nothing to do with that. He shouldn't fantasize about her no matter how she died. I just think it's silly to call the Tsar and his family martyrs when they were only killed indirectly for their faith. Passion-Bearer is a far more apt title. I'm sorry I even resurrected this matter. Okay people, let's get back to the purpose of the thread. God bless. Which is staring at blasphemous pictures? Guess so. Or maybe posting them. I simply budged in to get rid of tension before it foments into something bigger. That was probably a wise decision. I'd start posting schlock icons but I have no idea where to find them. I did a Google search yesterday, and almost all the pictures came back to something that has already been posted on this site. Is that, er, Eastern Catholic? I can almost hear some of our more anti-ecumenical posters throwing their computers across the room. It is Orthodox (you have inspired me to start using "er", but it doesn't fit in here). It is a 1967 commemorative miniature from the Ecumenical Patriarchate to the Vatican. I would like a reproduction, but I haven't seen any. Er, two, I would donate one to New Skete.